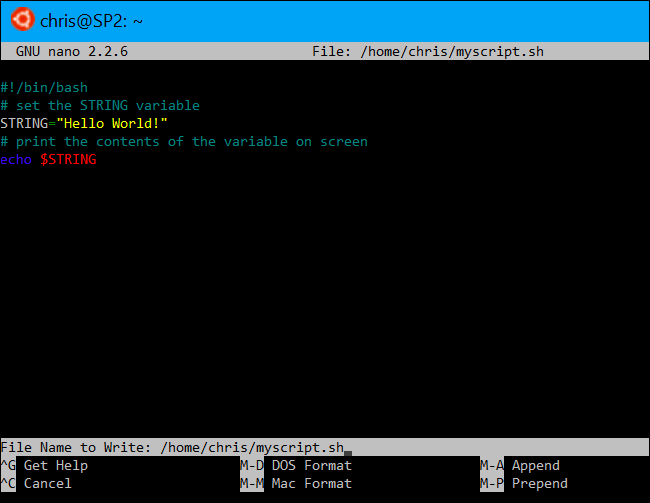 With the arrival of Windows 10’s Bash shell, you can now create and run Bash shell scripts on Windows 10. You can also incorporate Bash commands into a Windows batch file or PowerShell script. Even if you know what you’re doing, this isn’t necessarily as simple as it seems. Windows and UNIX use different end-of-line characters, and the Windows file system is accessible in a different location in the Bash environment. When writing shell scripts on Windows, bear in mind that Windows and UNIX-like systems like Linux use different “end of line” characters in text files in shell scripts. In other words, this means that you can’t simply write a shell script in Notepad. Save the file in Notepad and it won’t be interpreted properly by Bash. 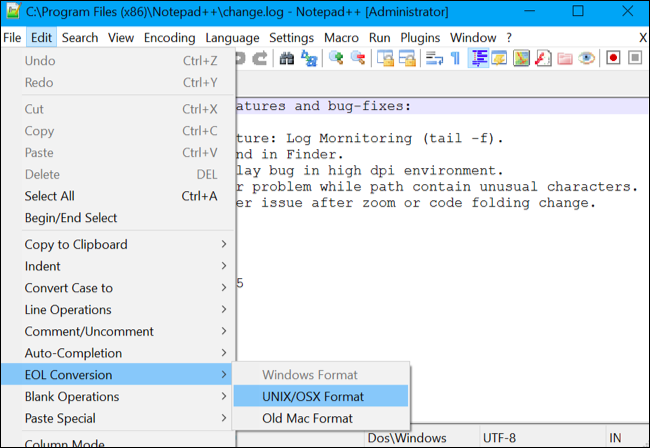 However, you can use more advanced text editors–for example, Notepad++ allows you to give a file UNIX end-of-line characters by clicking Edit > EOL Conversion > UNIX/OSX Format. However, you’re better off just writing the shell script in the Bash environment itself. The Ubuntu-based Bash environment comes with both the vi and nano text editors. The vi editor is more powerful, but if you’ve never used it before, you may want to start with nano. It’s easier to use if you’re new. Enter the commands you want to run, each one on its own line. The script will run each command in turn. Add a “#” character before a line to treat it as a “comment”, something which helps you and other people understand the script but which isn’t run as a command. For more advanced tricks, consult a more detailed guide to Bash scripts on Linux. The same techniques will work in Bash on Ubuntu on Windows. Note that there’s no way to run Windows programs from within the Bash environment. You’re restricted to Linux terminal commands and utilities, just as you would be on a typical Linux system. If you’re using the Nano text editor, you can save the file by pressing Ctrl+O and then Enter. Close the editor by pressing Ctrl+X. To run the script, you can now just run it in the terminal by typing its path. Whenever you want to launch the script in the future, just open the Bash shell and type the path to the script. To access Windows files in the script, you’ll need to specify their path under /mnt/c, not their Windows path. For example, if you wanted to specify the C:\Users\Bob\Downloads\test.txt file, you’d need to specify the /mnt/c/Users/Bob/Downloads/test.txt path. Consult our guide to file locations in Windows 10’s Bash shell for more details. Lastly, if you have an existing batch file or PowerShell script you want to incorporate commands into, you can run Bash commands directly using the bash -c command. This trick allows you to add Bash commands into batch files or PowerShell scripts. The Bash shell window will appear when a Bash command is running. Update: If you have multiple Linux environments installed, you can use the wslconfig command to choose the default Linux environment used when you run the bash -c command. To create a shortcut to a Bash script from within Windows, just create a shortcut like normal. For the shortcut’s target, use the bash -c command we outlined above and point it at the Bash script you created. For example, you’d point a shortcut at ” bash -c "~/myscript.sh" ” to run the example script above. You can also just run this command from a Command Prompt or PowerShell window, too.